Wilson's ninth entry comes after Lake Travis beat Smithson Valley 45-14 in a first-round playoff contest. The win puts the Cavaliers at 10-1 overall as they advance to play Madison. Yeah. Garrett Wilson's still got it. After a minor back injury had kept him off the field since Oct. 12, the five-star Ohio State commit returned to Lake Travis' offense last weekend, and did so with a vengeance. In a 45-14 drubbing of Smithson Valley in a first-round playoff contest, Wilson showed up and showed out, hauling in six passes for 147 yards and a touchdown. "I was super excited to be back playing with all of my brothers," Wilson said. "I feel like I played high-energy all game, and was doing a lot of dirty work for the team." 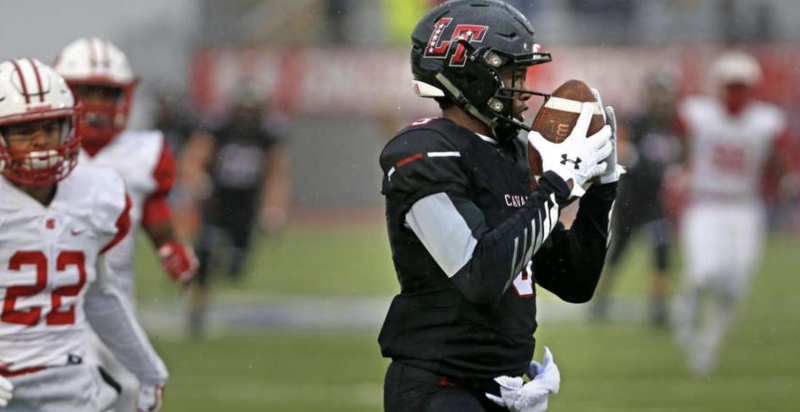 The 45 points that Lake Travis scored marked the fourth straight week where the Cavaliers have scored 40-plus, and the eighth such occurrence in the past nine weeks. You'll have that with receivers like Wilson and a quarterback like Hudson Card, who's committed to Texas. "Our offense is dynamic because we are unpredictable and equally effective running and throwing the ball," Wilson said. He's not wrong. In the win, the Cavaliers racked up 469 total yards of offense, 344 of which came through the air. But the 125 rushing yards came on just 26 attempts, or 4.8 per carry. Up next is a matchup with San Antonio Madison, a team that boasts of a 9-2 record after losing its first two games this season. Garrett Wilson had 6 catches for 147 yards and a score in last week's first-round playoff game. They are a strong running team that has won nine straight," Wilson said of Madison. "That streak for them is dangerous." And, as always, Wilson will be on the field Friday taking care of his own business before watching football Saturday ... specifically Ohio State. And as we all know, the Buckeyes haven't and won't play in a bigger game than they're about to this weekend. "The rivalry between Ohio State and Michigan is the best [in college football] because it runs deep, and it's true hatred," Wilson said. "The players, coaches, and fan bases legitimately hate that team up north and don’t have to fake a thing. We’re also both good at football, so that helps." Wilson's prediction? Ohio State over Michigan, 28-20.